Investors have voted against corporate executives’ pay packages a bit more often than usual this year. About 50 companies in the Russell 3000 index — from Mattel Inc. and Mondelez International Inc. to Walt Disney Co. and Wynn Resorts Ltd. — have had less than a majority of shareholders approve their executive pay packages so far in 2018, according to data from consultant Semler Brossy. That’s more than in the past two years, when about 35 companies in the index failed their vote. Say-on-pay votes required by the Dodd-Frank law are nonbinding, but companies still pay attention to them. Anything less than a majority is considered a failure that warrants a retooling of the company’s pay plan and the explanation given for it in disclosures. This year’s figures aren’t not far off from the average failure rate, which has stayed low since U.S.-listed companies started giving their investors a regular ‘say-on-pay’ for the CEO and other top executives in 2011. “There’s a small group of companies that are repeat offenders,” said Todd Sirras, Semler Brossy’s managing director. Bed Bath & Beyond Inc. investors this year rejected CEO Steven Temares’s pay package for the fourth time in four years, even after it was cut to $14.6 million amid a sales slump. Most of the companies that failed their pay votes this year had majority support before, according to an analysis by advisory firm Willis Towers Watson. First-time failures are running high in 2018, but they’re not at all-time highs, said Jim Kroll, Willis Towers Watson’s lead consultant on say-on-pay voting. “For some companies failing for the first time, it may not have crossed their mind that this could happen to them,” Kroll said. One of the companies that failed for the first time was Disney, which gave $100 million in stock awards to CEO Bob Iger as he signed on to a longer contract to see through a purchase of film and TV assets from 21st Century Fox Inc. Disney said it would take the vote result under advisement in weighing future pay. The reasons behind a failure vary for each company, but they’re often a result of mismatches between executive pay and corporate performance or a lack of responsiveness to shareholder concerns. A substantial increase in pay, including large one-time awards or grants like the one at Disney, can also trigger a low vote. So can a perceived lack of rigor in performance goals. Companies that fail their pay votes usually go on what Sirras called “a listening tour” with investors afterward. “Many times a company will have a bad vote result and then respond after the fact, even if they knew it was coming,” he told Bloomberg Law. Sirras said he tells clients to talk with shareholders in advance “so they’re not surprised” when pay details are disclosed. Despite the failures, more shareholder outreach and better compensation-related disclosures have helped keep pay vote results relatively unchanged from year to year. 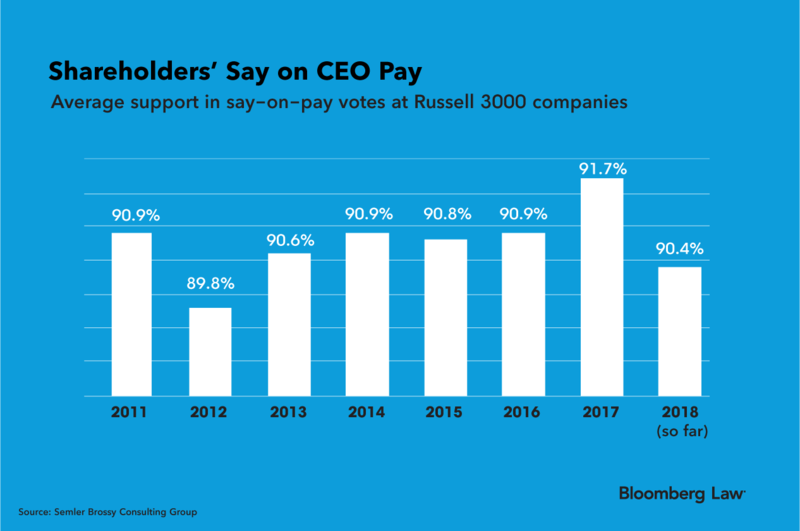 The Semler Brossy data show average shareholder support for corporate executives’ pay packages has hit its lowest level since 2012. But even then, such support is still around 90 percent. Companies usually don’t compare themselves to that average, according to David Thieke, a senior principal in Mercer’s executive compensation advisory. Instead, they look back on their own results from prior years or those of their major competitors, he said. “Individual companies tend to take a more introspective approach to say-on-pay,” Thieke said.